Four Beautiful Apartments with Private Pool and Air Conditioning throughout. Bar on-site for all your needs. In a quiet area 5 minute walk in to town. 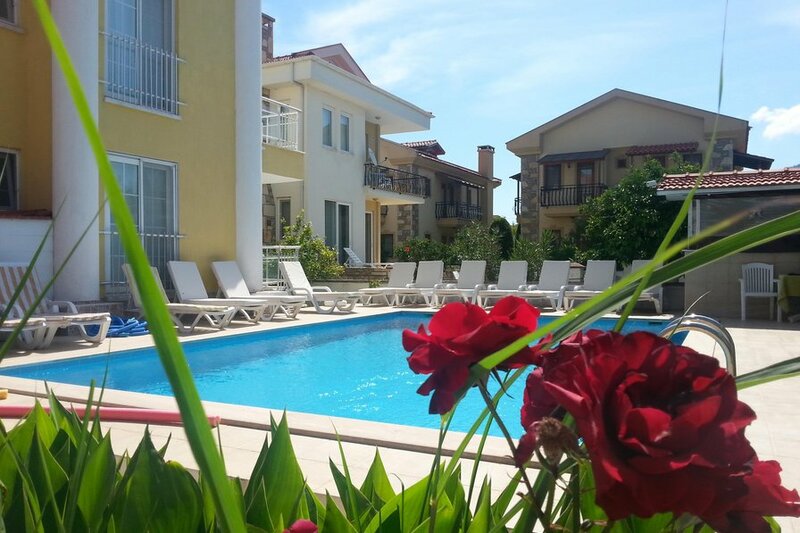 Our Apartments are set in their own Gardens in a quiet area of Dalyan only 5 minutes walk to the centre of Dalyan and there are Supermarkets nearby. Our Apartments are newly built and are equipped with 2 Bedrooms and a Salon/Kitchen. There is Air-Conditioning in the Salon Area as well as Television which has BBC News. As well as the bedrooms there is a Sofa Bed in the Salon. The Kitchen has a Fridge, Kettle and a Gas Hob. Each Apartment has a Balcony with Table & Chairs. There is a Swimming Pool at the front of the property and Sun Loungers for your use. We have an Internet Connection that you can use. The Owners live on site and can serve you Drinks, Breakfast and an Evening Meal if required. The Centre is 5 Minutes walk from the Apartments along with the Weekly Saturday Market. Dalyan has a wide range of Shops, Bars & Restaurants to suit everyones needs and tastes. Dalyan is set along a River and you can take daily boat trips to many different places including the Beach, Mud Baths, Hot Springs, Lake Trips, Fishing Trips and many more to try. Iztuzu Beach is 35 Minutes from Dalyan by Taxi Boat or 20 Minutes by Road on a local Dolmus which leave Dalyan every 15 Minutes. Dalyan is very green and peaceful and is located 25 Minutes from the International Airport at Dalaman.